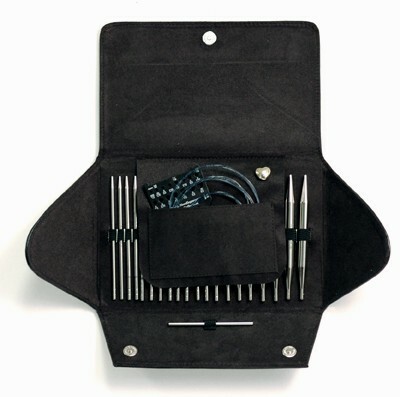 addi Click Interchangeable Turbo Needle Set is one of the most popular interchangeable knitting needle sets on the market. They feature some of the best joins out there with a lifetime warranty! We love the addi Click Sets and know them inside and out. If you have questions on anything addi make sure to contact us, we are happy to help you figure out which set is right for you. The addi Click Interchangeable Turbo Needle Set system provides 10 different sizes of addi Turbo® tips (3.50 mm, 3.75 mm, 4.00 mm, 4.50 mm, 5.00 mm, 5.50 mm, 6.00 mm, 8.00 mm, 9.00 mm, and 10.00 mm), three different lengths of our new, extremely pliable blue cords (24”, 32” and 40”), and one connector piece which helps to either store stitches or combine your cords. The Click tips require no tools to change; simply insert the cord deep into the tip, twist and release. The tips will remain secure until you change them, thanks to the Clicks' revolutionary locking mechanism!